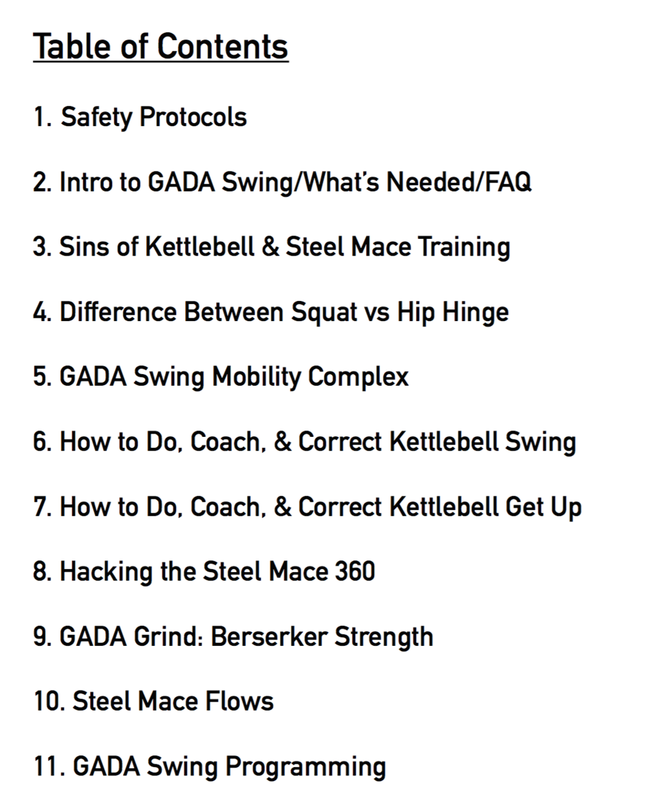 So over the past couple months since the release of GADA Swing: Guide for Kettlebell & Steel Mace Training, I’ve gotten great feedback from many of you all over the world — it’s now sold in 10 different countries. However, I’ve gotten a lot of questions as to WHY steel maces are a perfect one-two punch with kettlebells. I’ve been working with kettlebells for more than a decade (being a certified StrongFirst Kettlebell Instructor) and working with steel maces for over 4 years. So I’m not only going to answer the most common questions, but give you a preview of what my GADA Swing ebook has to offer. What's in GADA Swing exactly? It’s a PDF file that can be downloaded on your desktop or mobile device. There are over 130+ private hyperlinked Youtube videos to show you the proper form, technique, and details to every movement. Here on your right, is the Table of Contents for GADA Swing. Every chapter subject covered is broken down in detail with readable text, tutorials, and easy coaching correctives for common compensations. So how does the GADA Swing Programming Work? The goal of this ebook is for you not only to become stronger, but to be more aware and knowledgeable on how to move better. If you want to be sweaty and sore...go into a sauna and have someone beat you with a stick if that’s your goal. These GADA Swing workouts are designed to challenge you, but not overwork you for your daily life. Realigning your posture, realizing your weaknesses, and working on them is what gets you stronger. While there are many great fitness tools, we need to keep this as simple as possible utilizing ONLY the kettlebell & steel mace. It’s NOT about how much you can do with as many modalities and reps as possible, but rather what you can accomplish with less. There are 12 workouts EACH for beginner, intermediate, and advanced level athletes; with four bonus steel mace tire striking workouts. So you get 40 workouts. That’s three months of training to utilize the kettlebell & steel mace. If you’re not familiar with hyperlinks, it means when you click on each exercise name on the PDF file - it will take you to a direct private YouTube video link as pictured below. If you want to perform safely and get stronger...having the right guidance makes a huge difference. So if you have any other questions about GADA Swing: Guide for Kettlebell & Steel Mace Training you can follow me on Instagram or email me here. You can purchase it HERE at this link. Hoping I gave a better idea of what I can offer both educationally and program wise for kettlebells and steel maces.